We’re bouncing and hopping along with the latest Warners breakdown! 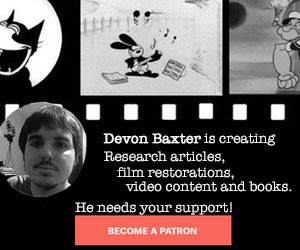 Bob McKimson, along with his writer Warren Foster created comic situations, which would be repeated in several Warners cartoons. With Hop, Look and Listen, Sylvester encounters an escaped baby kangaroo, which he believes is a giant mouse. Much of the story elements in this film, including the bulldog administering tough love to Sylvester to conquer his fear of the “muscle-bound mastodon,” were re-used—with more verve and stronger gags—in the kangaroo’s next appearance, Hippety Hopper, released the following year. Sylvester’s clashes with Hippety Hopper continued in a number of films, including some that portrayed Sylvester as a father to his impressionable son, Sylvester Junior. The three animators credited on the film—Charles McKimson, Manny Gould and Izzy Ellis—appear in the draft, with Fred Abranz and Anatolle Kirsanoff receiving no credit for their animation. In Sylvester’s first starring role for McKimson, he appears more of a slob than his overall design calls for, a clownish type. Pot-bellied and short-legged characters seem to pervade McKimson’s cartoons during the ‘40s; Jean Blanchard presumably designed his characters then. 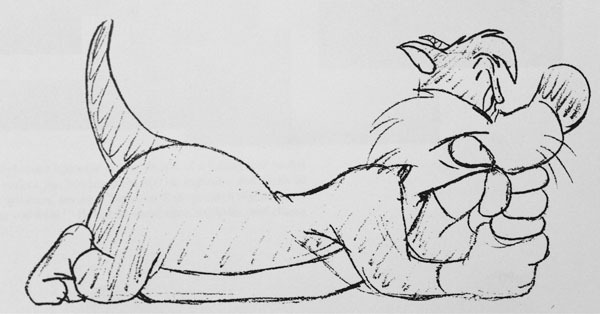 Ironically, in the film, Sylvester feels that his failure as a mouse catcher is due to his body shape, and exercises with various equipment, in a montage sequence (animated by Izzy Ellis) reminiscent of Bob Clampett’s Warners cartoons – with different solid color backgrounds. Gould’s animation is wonderfully broad, lending an “over-acted” appearance to his characters, such as Sylvester’s tirade about the lack of mice to eat, while tossing his inadequate morsel back into the mouse hole, in scene 13. 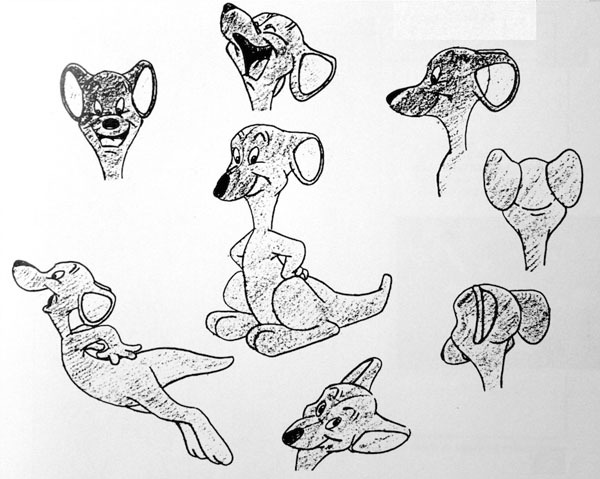 Gould also exhibits subtlety in his animation for Hop, Look and Listen; in scene 25, as the bulldog berates him for lacking “professional pride,” Sylvester looks down in disgrace before he is lifted up. Later in the film, Gould animates a great personality touch as the bulldog storms in the house–before mimicking the action of cocking a “hat”–after Sylvester’s failed attempts at overpowering the baby kangaroo, in scene 43A. The next scene of the bulldog’s reaction of the “giant two-headed mouse,” animated by Kirsanoff, is another small example of the former Clampett ideal. Cornett Wood was McKimson’s layout artist during this period; he worked in Clampett’s unit before he left the studio in the mid-‘40s. Wood formerly worked for Disney as a chief effects animator on films such as The Old Mill, Snow White and the Seven Dwarfs, Pinocchio, Fantasia and Dumbo. He left the studio during the strike of September, 1941. Wood’s layout work is clever in this film; in scene 8, Sylvester’s introduction is shown in a wide shot, establishing him—or at least, his owner—as a prize fisherman, as he sets out in appropriate fishing attire. The following scene pays off nicely, as it’s revealed what Sylvester is actually luring. When the baby kangaroo enters the cellar, and in between the walls, Sylvester hears the bouncing sounds (scene 16), staged in a low angle. The staging becomes wider and is set higher, in scene 19, as Sylvester struggles with the fishing line and is pulled back. Later in the film, the action is set at a wide down-shot, with Sylvester chasing after the boundless kangaroo with an axe (scene 31). 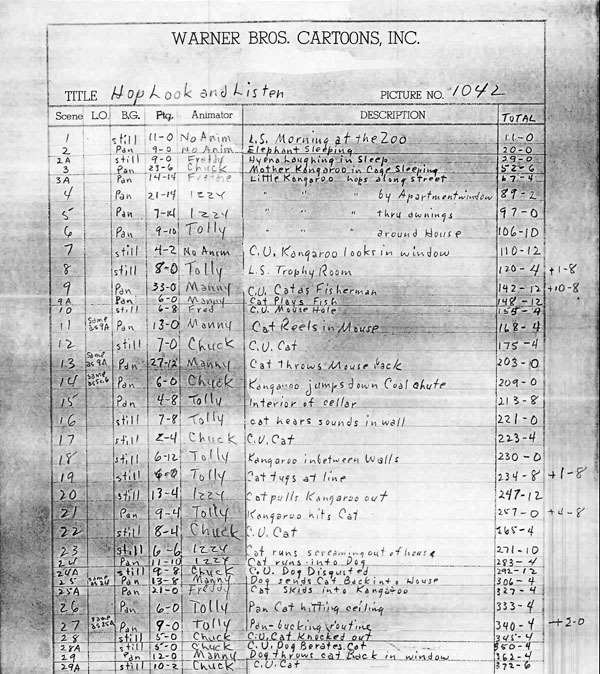 The orchestra scoring for Hop, Look and Listen occurred on March 29, 1947, almost exactly a year from the dialogue recordings. (Chuck Jones’ Rabbit Punch was recorded on the same day, since the productions were adjacent to each other.) The song underneath the main titles is “You Never Know Where You’re Going Till You Get There” (Sammy Cahn/Jules Styne) from the 1946 film Cinderella Jones. 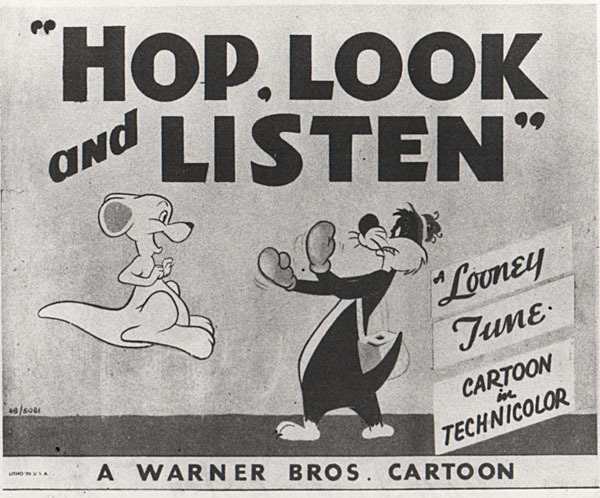 Sylvester sang this tune in Friz Freleng’s Back Alley Oproar, released a month before this cartoon. John F. Barth’s 1910 college march “Frat”, used by Stalling in many Warners cartoons, often with scenes involving sports, accompanies Sylvester’s “strengthening his sinews” and his final match against the baby kangaroo. Surprisingly, no commercial recordings can be found of this composition online. Now stop bouncin’ around like a flea on a hot brick, and enjoy the breakdown video! Kirsanoff’s animation is both loose and expressive here. It’s a shame he never got on-screen credit for his work (especially at a time when the unit was one animator credit short due to Rod Scribner’s illness). It’s also interesting that, after being the go-to guy for shared character designs for 6-7 years, McKimson’s designs (with Blanchard) for some of the shared characters in the 1947-50 period ended up so much more off-model than the other units. 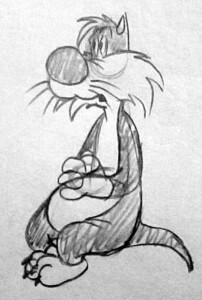 Sylvester’s extended muzzle and nose along with his chunky body — a problem shared with Bugs during the same time period — are quite a distance from the design Friz, Chuck and even Art Davis were using at the same time (Artie’s unit may not have gotten the voice right, but his Sylvester in the vacuum cleaner scene from “Catch as Cats Cat” looks more like the standard design of the character we know today than anything the McKimson unit would do until the early 50s). 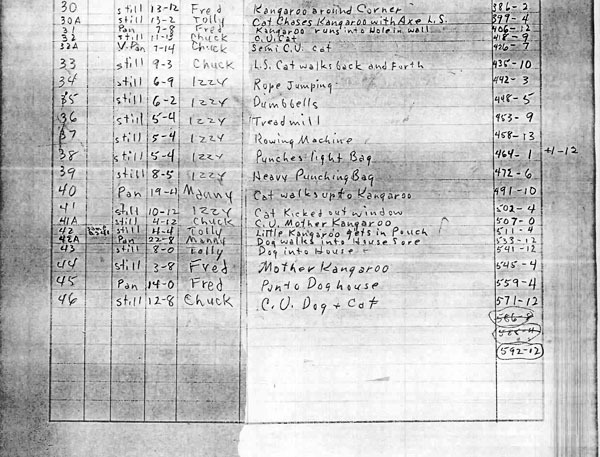 It’s also interesting to note that “Frat” was used by Stalling as the melody for the tribute to father in the Chuck Jones cartoon, “A BEAR FOR PUNISHMENT”. Until now, I didn’t even realize that the familiar tune had a name. Then, it is obvious that “Frat” goes back to its possible first use in “ALONG FLIRTATION WALK”. Then again, perhaps it also showed up in “FREDDIE THE FRESHMAN”. That’s a pretty gorgeous print compared to the one I usually see on Cartoon Network. Let me guess, a Golden Collection copy? My favorite scene in this short is Sylvester’s amateur boxing moves when he prepares to fight Hippety Hopper, with his superfluous arm reach at 5:54 being the highlight. Then Hippety Hopper just kicks him out the window with zero effort. The animation and timing on that is just perfect. Anyone ever notice that the best Hippety cartoons are the ones – such as this – that don’t involve Junior? Has anyone ever noticed how much that kangaroo looks like McKimson?